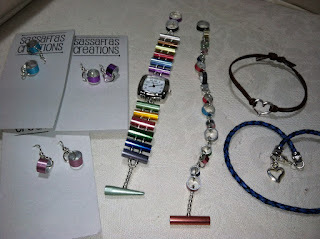 No one needs to worry that I'll become competition for them, but yes, I did decide to try to make myself some bracelets. And for those strands pre-made and all I have to do is add a jump ring or two and a closure? I can handle it. 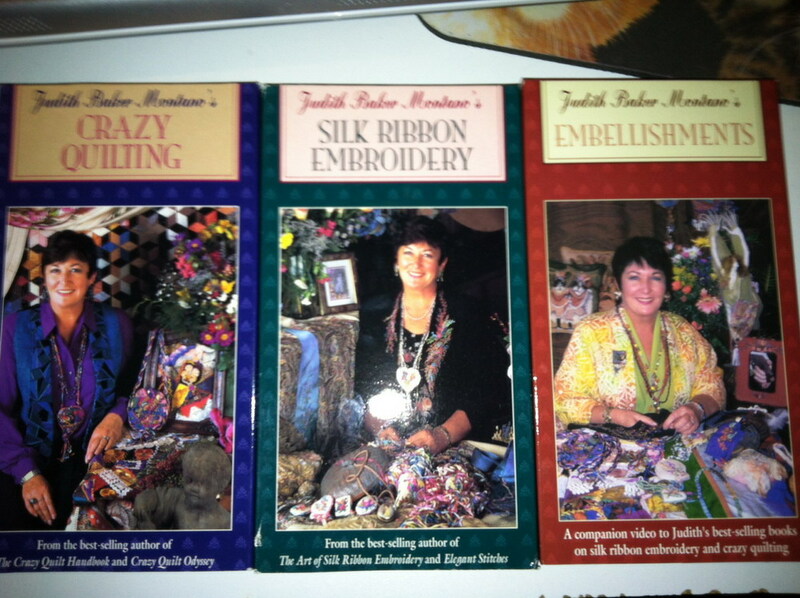 But when it comes to stringing beads (ok, I'm still fine there) and using a crimp bead to close it (on stretchy cord)? FUGEDABOUDIT! I have no coordination to use the tools to crimp it closed over those ends...maybe a bunch of practice, or perhaps different crimp beads? But hey! 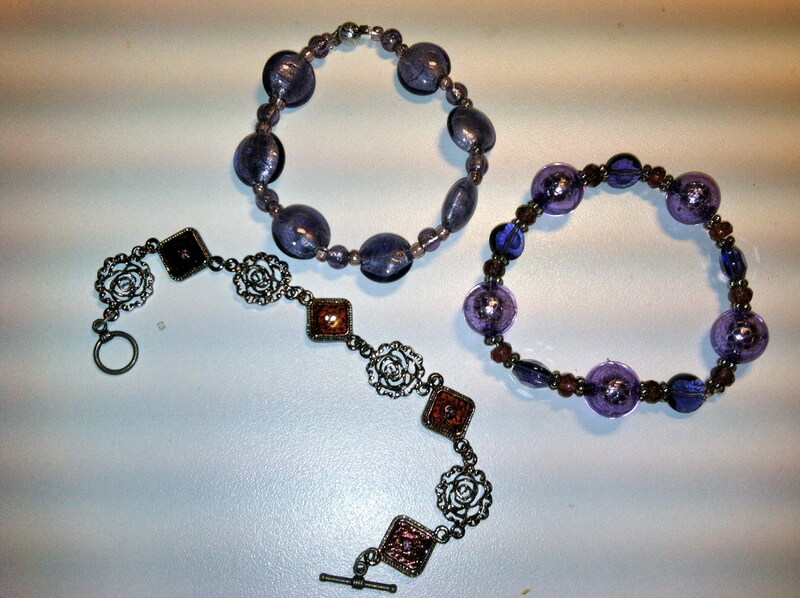 I've got three new bracelets for an evening's worth of work. And I think The Tonk will probably injest a teensy tiny silver bead (unless it truly did slip under the bookcase of fabrics) before I find it. I guess those trays with the fuzzy lining are worth the price? Yes, you can see by the ticker up there on the header that Nana Sadie Rose is headed to another fun event! If you're in or near Alexandria, Virginia, on September 22, do drop by the St. Luke's Episcopal Church parking lot on Fort Hunt Road for the St. Luke's Craft Show. This was one of my very first shows back in 2004! It was such a nice show, that we went the next year, too, but then got into going to the National Capital Cat Show which always occurred the weekend before St. Luke's! It just wasn't possible for me to do both of them, so the Cat Show won out. But this year we decided to go back, once we knew that National Capital wasn't going to be held! I'm so looking forward to this lovely smaller show. I do hope I'll see you. And, just a little tiny hint: if you come? You might even get a chance to meet My Sweetheart, as he's agreed to come help set up and take down the booth! A Swap! I LOVE Swaps! The Chronic Stitchers group on Ravelry decided to have a swap, and what fun it was. EXTRA special in that gift was the pretty rose-strewn journal that my swapper hand wrote some of her favorite quotes into...it's really a very meaningful gift, and the yarn is amazing, too - I've not used Debbie Bliss yet! Whoohoo! And that's a Utah chocolate raspberry truffle bar, there, so you know I'll be enjoying that one, right? It's mid-week, and I'm posting! Please don't faint? I wanted to share a bit with you. When I was at Backstitches a couple of weekends ago, I might have mentioned that I found a felted bag pattern that I adored and decided I needed to knit. 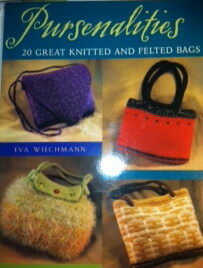 It was from this book, and I was able to pick that up from someone on Ravelry who was trying to weed out her book collection (I am not at that point yet, but am trying very hard to contain my collection to a smallish corner of the "library." heheh. Wonder how long I'll be successful?). So, Pursenalities joined my shelves this week. Then, Barbara-Kay (who truly used to have a great blog, but isn't updating it anymore -sigh) asked if I'd like a copy of this book since she was gifted it twice! 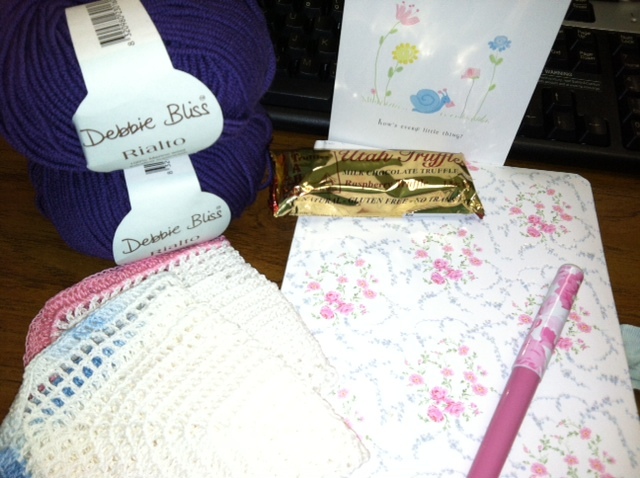 I was delighted, as it's been on my wishlist for some time...THANK YOU, B-K! It took three tries before I was satisfied with the toe...and it fits! 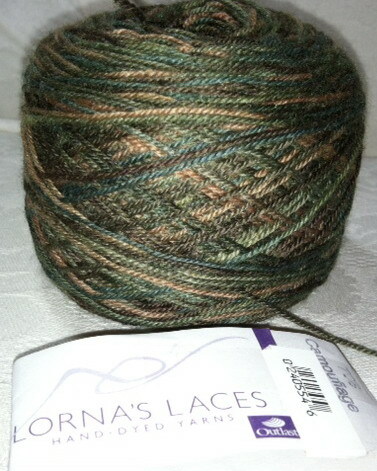 So I think I'm on the right track now...lots of knitting before I begin to work the heel, as MS has a size 12 foot. Oh! Two Posts in Three Days? I had several women stop and ask me about sock knitting, one young woman came running over and said, "Oh! I'll be back!" 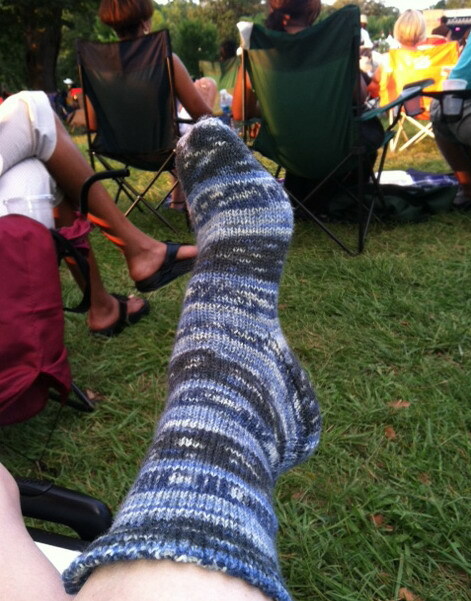 and came back with her camera to photo my foot with the not quite finished sock on it. She was ecstatic as she'd told her fella that since he was so involved in golf, she was going to take up knitting and all weekend she'd been looking at people's sweaters everywhere she went (I thought, "Really? In this heat they're wearing sweaters?" but I let that slide). 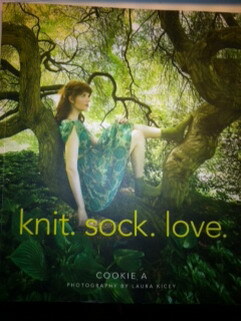 And now she'd found someone knitting a sock and she was convinced it was EXACTLY what she wanted to do! I hope she does, she was so excited! 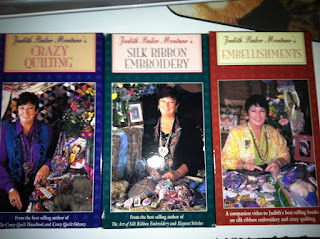 My VCR has died and so if you still have one, and you're interested in silk ribbon embroidery, this is the set to have. I'd love to send it your way for $10 for all three and then when I know where it's going I'll let you know the shipping cost. Just send me an email or leave a comment here, okay? It's Been HOW Long? OY! Two weekends ago, I traveled down the road to MS's home to spend the weekend there. 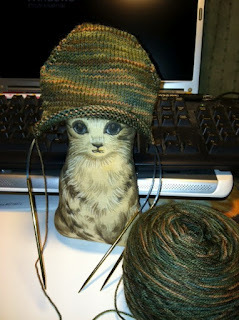 We discovered Backstitches, a knitting shop in Lynchburg that doesn't have a website. 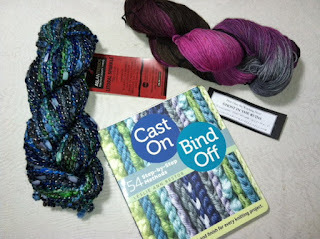 There I picked up the blue yarn you see in the photo, an AslanTrends Litoral Sparkle in a beautifully saturated blue/green colorway with silver sparkles thru it. The yarn came with a shawl/scarf pattern that MS really liked when he saw the sample, so of course, once the color was decided upon, I had to get it, right? 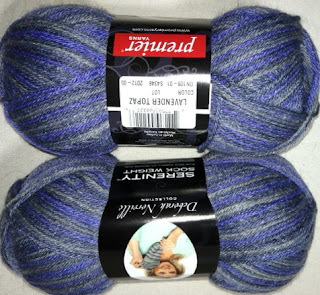 I ordered a couple of skeins of this Debra Norville Serenity Sock yarn when I saw it at the same time I was ordering straight needles from Knitting Warehouse. You know I love the gray and purplr combo, right? And once the insurance check came in, I set about rebuilding my jewelry chest (hah - don't think any of this is IN that chest, as it's not...). Nancy Thompson of Sassafras Creations was delightful, as always, to work with, and Rose of Sparkle Junkie has become a friend, as well as helping me replace some of the leather and silver bracelets I had come to love. Both shops I can highly recommend, if you're not familiar with them! That's the colorways Raven, Natural, and Timberwolf. 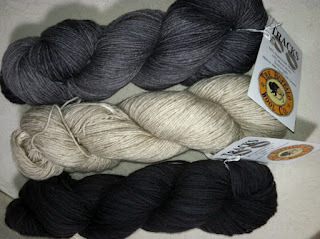 When I saw the three colors together I was completely sold, and then after seeing a special offer on Facebook, I jumped and quickly save a bit on the price of the 3 skeins. We've been incredibly busy in August, with every single weekend involved in some event or other, but last weekend was the one both MS and I had been looking forward to all summer: Jazz Fest at Maymont in Richmond, VA. We took a long weekend and spent two full days enjoying excellent performers in a truly exquisite setting. I can tell you, it doesn't get a lot better than this. We also stayed in the truly delightful (if a tad quirky) Lindon Row Inn. When we checked in on Friday night, a wedding reception was being held in the courtyard garden that Edgar Allen Poe played in as a child! The combo that was providing music was really, really good! So that's how our weekend began, and then we went out to dinner with MS's son and his girlfriend to Elephant Thai. My first real Thai food, and oh my! I love it, tho' next time, I will suggest just a tad hotter than mild, rather than my usual "medium." Saturday dawned cloudy and gray, and we both were a bit on edge about that. It stayed that way most of the day, and about 3, the rain began. We had raincoats, and umbrellas and were seated back in the trees, so it wasn't horrid, but MS said we could leave. I wasn't willing to, as there were acts upcoming that we'd wanted to hear, and it was iffy enough with the weather that it could clear up by the time we'd gotten back to the car! Not worth that. So we stayed, and got back to the hotel about 11pm, tired, achy, but oh, yes, HAPPY! On Sunday, before we headed out, we went down to Carytown to shop a little, as MS had discovered in his online research before our trip that there was a yarn shop there! I stopped in to The Yarn Lounge and picked out two skeins of yarn. The staff was friendly and helpful, but also left me to browse, as I love to do, so I rate them decently high on my list of fun places, and they're quite likely to see me again, since MS has family in town, so I'm sure we'll be back again! That's Lorna's Laces Sock in Camouflage (but we're calling it "forest" because he's not in the least taken with anything involving a war-image). The toe is on the needles as we speak! Of course, in between these lovely weekends, we've been back at work, so you know well, that it's been a crazy few weeks here...I promise I'll try to do better and I hope you'll keep stopping by.